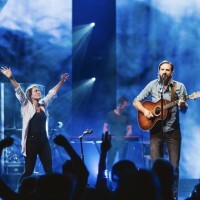 When in 2016 Bethel Music released "No Longer Slaves" by Jonathan David & Melissa Helser they brought to the world Church one of the most impactful worship songs and gripping performances of the last decade. 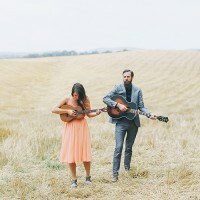 Few who have experienced the husband-and-wife duo perform the song at the Big Church Day Out or watched the couple's breathtaking performance on Bethel Music's 'We Will Not Be Shaken' project will remain unmoved by the passionate reminder that we are no longer slaves to our selfishness and sin. But like all worship song classics there is a back story to be told. Jonathan recently started a solo tour of the UK. Earlier this year Cross Rhythms spoke to this powerfully anointed man of song. Tony: Tell me a bit about yourself. Jonathan: I was born in North Carolina and grew up with an amazing family. My dad is actually a musician, pastor, storyteller, artist - his name's Ken Helser. I just grew up in an incredible family and really started walking with the lord in my high school years; met the Lord at a summer camp that my dad actually pastored but it was through worship really that my heart really got drawn in to the presence of God. Tony: Do you think conversion experience can come during acts of worship? Jonathan: Yeah, I really do. It is happening. I think a lot of times too it's hearts get softened during worship and when the Gospel message comes they're just ready to say yes and the seed's ready to be planted. I actually came over here to the UK when I was 19 and did a school with Youth With A Mission in '97 and that's when I first started playing music. Wrote my first two songs here in the UK so it's fun to be back here 20 years later. I went back, met my wife a year after that, we got married when we were young - 20/21. We joined my parents in ministry, started a summer camp and then after seven years from doing summer camp we started a school called The 18 Inch Journey, that's a school for the heart. 18 inches is the distance from your head to your heart so it's a school for your heart. We've been doing that for 17 years now. Tony: How did you meet your wife? Jonathan: We met at a ministry school in Charlotte called Morning Star. After our second year of school we said yes to one another and have been in love for the last 17 years. Tony: Morning Star rings a bell. Tell me something about Morning Star. Jonathan: It was a school Rick Joiner started and they had an incredible worship track that year by a guy named Don Potter. He led the worship track. He was a real father to me and Melissa in our life. Tony: So you knew right from the off that this young lady that you'd just met was a singer? Jonathan: You know, actually I didn't. It was only seven years into our marriage that she really started singing and writing music, so that was a surprise. Tony: And when you started to write songs were they all for the sole purpose of corporate worship? Jonathan: No, I think it was just from an overflow of my own heart of worship to the Lord. Some were more corporate and I think some of the songs people just started to sing along with. Tony: You've been recording albums, first as a solo artist, and now with your wife, for years. Now you're finally playing to big crowds, winning Dove Awards, etc, etc. Jonathan: It's been a really slow building and I look back now after 17 years - we just started serving my mom and dad, started a summer camp, a tiny little camp, 20 kids. Now I look back and I'm like, wow, how did this happen? And this is still way more than I ask or imagine but that's the business God does. But at the same time it was level by level, stone by stone. He's been building this. Tony: Did you find that when you started recording, presumably you were pretty small time. Were you self-financed then? Jonathan: Yeah, the first thing that we did was a live album called 'The Awakening' in 2007. We had a guy from the UK named Graham Cook who is an incredible speaker, writer and teacher. He came in and actually helped support the album and it was like the relationship Samuel had with David, where Samuel saw a lot in David. Where other people just saw a shepherd boy, Samuel saw a king. Graham really saw something inside me and Melissa and he was able to pull it out and he helped us with the first album. It's raw and passionate. One of the songs is like 18 minutes long because it's live worship. Tony: Of all the recordings that you've done so far which couple would you say are the most significant? Jonathan: The last album we did is 'Beautiful Surrender'. It was a really special process, it was the first album we released with Bethel Music. We also got to work with someone who's now an incredible friend, an incredible producer out of Nashville named Ed Cash. We spent some phenomenal time with him. I think every album is like building an altar; you're remembering what God has done but what you're building isn't just for you, it's so that many other people can come back and experience God at that place. When I record an album it's just like stacking the stones of my journey so others can come back and encounter God there. I think when you're recording live and when you're recording in the studio there's a beauty to both and there are strengths and weaknesses to both. I think when it's live it's the moment, it's the spontaneous moment but when you're recording in the studio you can create something that's timeless. I think some of the Psalms are spontaneous eruptions from David's heart; some of them are crafted lyrics that he spent days pouring his heart over and shaping and moulding. I love both. Tony: What is the songwriting process like for you? Jonathan: For me it starts in worship, then there are moments where you stop and you craft and you shape but especially for a song that I want to use to lead people with I want it to be an overflow of my secret place time with him. Tony: How much does your wife take part in the songwriting process, or does she leave all the songwriting to you? Jonathan: No, we do it together and then she does some by herself and I'll write some by myself and then we'll come back together. So yeah, it's both. Tony: Is that an easy process or a difficult one? Jonathan: No, it's not easy, sometimes it's worth it though. We say a lot that without tension you can't make music. Take the tension out of guitar strings and there's no music to be made so I think it's in the tension of doing life, of being in the storm but believing God is good and then singing in that. It's the iron sharpening iron. She'll have an idea on a song, I might have the opposite but then in that stretching music's made. I think there's a beautiful holy frustration that's always in your heart because you're always longing for more. Even in David's heart you see it. Tony: Some folk have a real problem with the modern worship industry and record companies and publishers owned by multi-nationals making large amounts of money promoting and selling worship songs. Jonathan: Melissa and I feel really thankful, we have been really hidden in a lot of ways and then we have been a part of Bethel Music which is a church. There is a label side to it but it's a church and it's a family that's really fighting for one another, so I haven't actually had to swim in those waters. I'm sure they're out there. There is a lot of purity in what Bethel Music is doing and I'm so thankful that we get to be a part of that. But anytime God raises up something the enemy will do everything he can to stop it, just like when Moses was born and when Jesus was born, he does everything to kill it. No Longer A Slave .. just HAS to be among the most soul stirring testimonies that can be sung in Christian worship. Even at age 80 I play it over and over and over. I am ordained a Deacon in my church, and I tell everyone about this wonderful song.